Morris dancers; Askew Road Plastic Free campaign; charity cake stall; cake competition, Ice cream bike, crafts, jewellery and plant stalls; croquet; face painting; local artists. As well as being beneficial to businesses, this spring event is much enjoyed by the local community, so be sure to come along! The update meeting on the Listening Campaign will be upstairs at the Duchess W6 next Tuesday 2nd April, starting at 6.30pm and finishing by 8pm. For numbers please could you email annie@askewbusiness.co.uk to let us know if you can attend. Full Regulation 3 – LBHF is Developer: Use of part of the public highway for the placing of 1 coffee cart maximum size 1.5 x 2 x 1m from Monday to Sunday from 8am to 8pm. Full Regulation 3 – LBHF is Developer: Use of part of the public highway for the placing of 1 market stall maximum size 2.5 x 3 x 1.5m from Monday to Sunday from 8am to 8pm. Starch Green is a busy pedestrian thoroughfare, next to a green public space that residents’ and community groups have successfully campaigned for the Council to improve. There are already problems with antisocial behaviour there, including drug dealing, and local residents do not not want to see a stall that would inevitably attract loitering, thus giving cover to those with less innocent intentions. The proposed location for this 12 hour a day, 7 days a week stall is against the wall opposite the green, and next to the entrance of the Day Centre for young adults with complex mental and physical disabilities. The centre needs 24 hour, 7 day a week access and a calm environment in its immediate surroundings. Starch Green is much valued as a community space and is in frequent use for local events organised by charities and other groups. As part of their fundraising efforts, such events invariably involve their own refreshment stalls, and commercial competition would not be welcomed in this location. opposite, in Goldhawk Road. Residents want to support their existing local businesses , and it is council policy to do the same. We already have a problem with the litter left by drinkers, and do not wish to add disposable cups to the mix. The introduction of the proposed market stall to this location, would inevitably make it impossible to refuse further similar applications. People can comment by going to the Council’s website,using the reference number and searching via Planning Applications, then going through the relevant Comments page. for the attention of the case officer, Alexander Green. subject of “Peter Paul Rubens – diplomat and painter of genius”. bitter-sweet flavour that might be? charity, and giving their time for free. The Upper Room works with socially disadvantaged people to improve their lives, and give them a second chance. Our aim is to help people overcome the barriers they face, in order to find work and become economically independent. UR4Meals provides meals and essential survival services for the homeless and vulnerable. UR4Jobs offers a multilingual specialist employment support service. UR4Driving is an award-winning programme which helps ex-offenders avoid re-offending and to improve their employment chances by teaching them to drive. Join us for a festive day of Christmas wreath making, using pine cones, cinnamon sticks and other natural materials. This event is inside the Ravenscourt Glasshouses and is suitable for all ages. No need to book, drop in any time between 10am and 3pm, suggested donation of £6 per wreath. Join us for all things Christmas and to turn on the tree lights at Starch Green. There will be carol singing with Father Christmas in his grotto, his elves and suitably snowy scenes, plus bauble and wreath making, performers, roasted chestnuts and some surprises for all! This year’s event, once again organised in conjunction with HCGA, promises to be another great family occasion so do come along and the theme is Rudolf the Red-Nosed Reindeer. We’d love more carol singers to join the throng. Please email info@askewbusiness.co.uk to volunteer. Come and meet your local officers and discuss any policing issues or concerns you may have. Thursday 27 December 5-6pm Greenside Primary School. There are two ways to win – by Judges’ Prize or Public Vote. 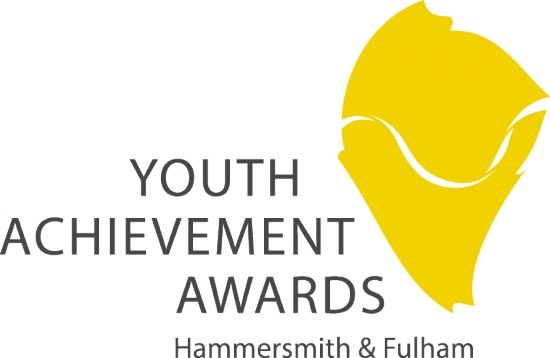 and three Public Vote categories at a gala presentation on Wednesday 7 November. Our next lunch is tomorrow, 31 July, 12.30-2pm, and we are back at The Orchard Tavern, 136 Askew Road, with Detour Café providing us with some tasty summer food: fresh salads with chicken, salmon or vegetable skewers. Eating is optional  you are welcome to come in and just say hello over a drink. Note: There will be no last Tuesday lunch next month as we always take a break in August. 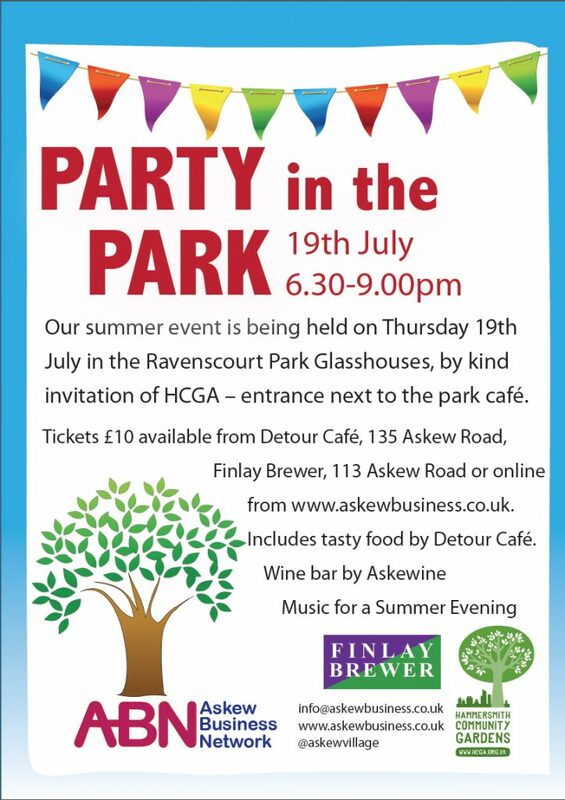 Please join us at our ABN summer party in the beautiful walled garden of Ravenscourt Park Glasshouses, by kind invitation of Hammersmith Community Gardens Association. Located next to the park’s café, the glasshouses date back to the 19th century and will provide shelter in the event of less than perfect weather. The £10 ticket includes a delicious quiche and salad from Askew Road’s Detour Café, and there’s a reasonably priced bar. With capacity for just 80 guests, tickets for this annual event are limited, so be sure to buy yours in good time. The glasshouses are beside the café in Ravenscourt Park, W6 0UL. Go through the gate and the entrance is to the right. 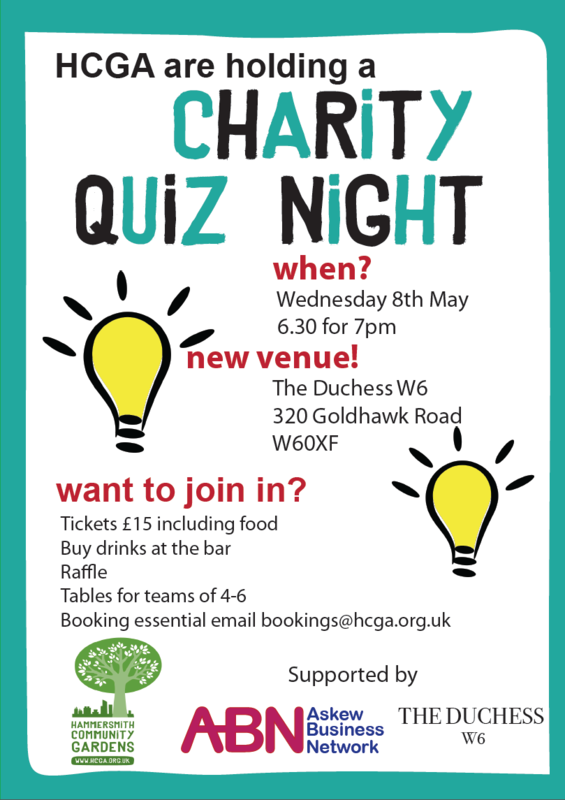 All tickets must be bought in advance, either from Detour Café 135 Askew Road, Finlay Brewer 113 Askew Road or online with an admin fee of 60p (please print out and bring the receipt). From 15-17 June, 59 open studios will throw open their doors during Artists at Home. This year they have a new and much more user-friendly website – http://www.artistsathome.co.uk. As well as browsing the artists’ images to see which studios they may want to visit, people can now choose their Favourites, devising a personal Art Trail which is also mobile-friendly. This will greatly enhance the visitors’ experience. As usual, there is a diverse range of styles and of disciplines: Painting, sculpture, jewellery, photography, printmaking, ceramics, textiles, fashion and mixed media. If you have visited open studios before, you are probably pleased to revisit your favourites and discover new ones. Don’t ignore studios which are a little isolated; they need your support too. If this is your first year of visiting Artists at Home, you have got a real treat in store for you!